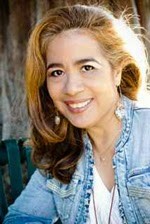 Please join me in welcoming author and film maker, Victoria M. Johnson to Conversations today! 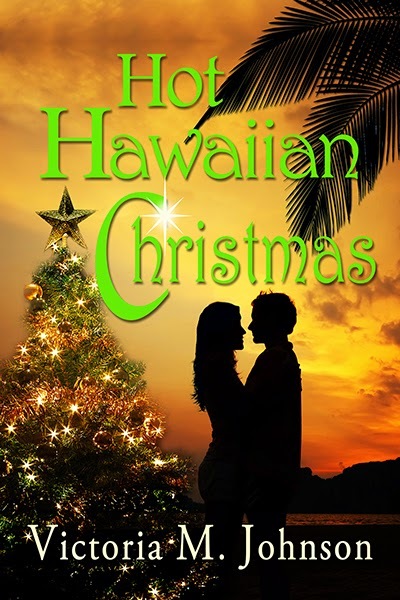 Victoria is here to talk about her new novella, Hot Hawaiian Christmas. So be sure and check out the cover, blurb and excerpt below! It's Christmas in Hawaii, but Lindsay Clark's vacation turns out to be anything but relaxing. With her uncle absent, she finds herself managing the hotel—a task at which she's normally very successful. However, Lindsay's life is turned upside down by the unfamiliar environment, Christmas festivities, and a very tempting guest—Chandler Lewis. He's the honorary Santa for the Kona Christmas parade and has a great life back home in California. Romance is the last thing on his mind. But when he meets Lindsay, he begins to wonder if life could be sweeter in Hawaii. Hot Hawaiian Christmas is a novella length ebook. Lindsay Clark stepped out of the taxi as the hotel and its surroundings took her breath away. Her uncle's Inn on the Beach sat right at the edge of the ocean in Kona, Hawaii. The waves crashed into the lava rock wall and splashed several feet high before rolling back into the sea. "Is there anything else?" the cab driver asked. Lindsay realized he had already planted her luggage at the hotel's doorstep. "Oh, just a moment." She dug in her purse for his tip. "Thank you." "Have a nice stay, miss," he said as he slipped into his cab. She pulled out the keys her uncle had overnighted to her and unlocked the door of her aunt and uncle's new hotel. Inside she found quaint Polynesian decor in the reception lobby and beyond that a spacious sitting room and a tiki bar. In every room expansive windows exposed a spectacular view of the Pacific Ocean and to the right, downtown Kailua-Kona. Lindsay exhaled and already began to feel herself unwinding. This place is perfect, she thought. Guests will love staying here. She spotted the staircase and decided she'd better find her room and unpack while things were quiet. Before she reached her bags, the telephone on the desk rang. Lindsay leaped at it to prevent it from ruining the serene ambience of the lobby. "Inn on the Beach, Lindsay speaking. How may I help you?" "Hello, this is Ginger Applegate. I need to speak to whomever is in charge." "Aloha, Ms. Applegate. That would be me." "My reservation starts tomorrow, but my daughter and I need to come in tonight. If we wait until tomorrow, we might be stranded at the airport." Lindsay did her best not to panic. The hotel hadn't been stocked with food yet. She didn't know if the bedding had been placed on the beds or if there was bedding on the premises at all. And she didn't know when the hotel staff was coming on duty. "Hello?" an impatient voice blared in her ear. "Yes, of course we can accommodate you early. What time will you and your daughter arrive?" The woman let out a sigh of relief. "Thank you. Our plane will depart in thirty minutes—I've been calling you for over two hours—we expect to land in five hours, and then there's the cab ride." "I apologize for the phone. It's fixed now. It sounds like you'll arrive in time for dinner. Have a pleasant flight, and we'll have your room ready." "Rooms. We have two rooms reserved." After she disconnected the call, Lindsay decided to get things in order and familiarize herself with the hotel. She hurried past the sitting room to find the dining room and then the kitchen. Just as she suspected, the refrigerator and cupboards had no food in them. Beyond the kitchen she found a laundry area, closet, bathroom, and elevator. Then she was back in the lobby. She'd gone in a circle. She headed back through the sitting area to the tiki bar. A glance behind the counter revealed that at least the bar was well-stocked. Lindsay rushed to the reception desk and flicked on the computer to check all the reservations. Before the computer powered up, the telephone rang again. Glancing at the phone Lindsay noticed that 14 messages were waiting on the answering machine. "A person, finally!" an exasperated female voice said. "What kind of hotel are you operating where no one answers the phone or returns calls?" "I apologize. I'm the manager, Lindsay Clark. How may I help you?" "Well, where's the real manager, Mr. Clark?" "He is unavailable, but I assure you, I am the real manager." "I am Mr. Chandler Lewis' assistant. I want to go over the checklist to be sure everything will be ready for his arrival tomorrow afternoon." Lindsay inwardly groaned. Her uncle had made it clear that Chandler Lewis was the priority guest. He had a checklist in the computer—which had finally powered on—but she hadn't seen it yet. "One moment please, while I retrieve the checklist. What is your name?" Lindsay asked, trying to stall while she glanced at the list. "I'm Ana Garcia," she said. "Any changes, any issues, any requests go through me." Lindsay recognized the attitude of a pushy assistant who liked to exert the power of their employer on others. That coupled with the absurd checklist confirmed her suspicions. What man required 200% Egyptian cotton sheets and that they be ironed? "Ana, I have the checklist in front of me, and everything is in order and will be ready for tomorrow." "Are you sure you don't have any questions? Mr. Lewis is very particular and demanding." "We have it covered. He will have a wonderful Christmas in Kona." "Well... if you think you need help... I could fly down there too...."
"No. That won't be necessary," Lindsay said, wondering if Ana had purposely made the checklist particular and demanding so that she would be needed. "Well, let me give you my cell number in case you have questions." Ana recited her number, and her tone changed from pushy to helpful. Lindsay did not reciprocate with her cell. She had a feeling Ana would be calling every day as it was. "Aloha." A truck pulled up the driveway and dropped off a grocery delivery. Lindsay knew that had to be her aunt's idea, and she silently thanked her as she put everything away in cupboards and the refrigerator. Just as Lindsay listened to the last non-urgent message on the answering machine, her cell phone rang. "Uncle Ray, how is Auntie Louisa?" "She's going to be fine; however, doctors confirmed she broke her leg. They don't want her to be moved for two weeks." "Poor auntie. Is she comfortable at least?" Lindsay asked. "She's miserable. She doesn't like lying in bed all day. And she's worried about you." "I've opened hotels before. I have everything under control," Lindsay lied. "Everything will be perfect for your guests." "We both appreciate you spending your Christmas vacation there. What are the odds? I finally convince you to take time off, and then we have to put you to work." "Don't worry about it. You just help Auntie Louisa heal and I'll hold down the fort. I do have some questions though." Lindsay had a dozen questions, but some were more pressing than others. "Remember Chandler Lewis needs to have his best hotel stay ever, or I'll have everyone in Kona upset with me, including the mayor," Uncle Ray said. "Maybe even the governor. I won't be able to golf anymore, and Aunt Louisa will be spurned from her circles." Lindsay laughed. "Okay. I get it. But I thought he was just the honorary Santa for the Christmas Day parade." "Just! They don't pick 'just anybody' to be Santa!" "Sorry. Of course not. I promise you he will have his best stay ever." She didn't get the hoopla over the man. He was just a regular business executive—a start-up entrepreneur. She'd dealt with plenty of them at her uncle's hotel she managed in Silicon Valley. "Thank you, dear. We know everyone's in good hands." After the call ended, Lindsay took a deep breath. Her uncle hadn't hired a bartender or chef because those were duties he and Auntie Louisa enjoyed doing themselves. They had only employed a groundskeeper and housekeeper and an on-call maintenance company. At least Uncle Ray would make the calls to ensure the housekeeper arrived in the morning. Even so, Lindsay felt this temporary assignment would be a relaxing walk in the park compared to her demanding job back home. In a way, she was on a vacation, she thought. Lindsay grabbed her suitcase and tossed it in her room. She'd unpack later. She pulled her hair into a ponytail and got busy making up the beds and stocking toiletries and linens in the bathrooms for tonight's guests. She mentally made a list of items to buy. The lobby and rooms all needed holiday decorations. That was something her aunt and uncle intended to do before their ski trip in Switzerland turned into a disaster. They were due in Hawaii two days ago, which would have offered plenty of time to put the finishing touches on their cozy hotel's grand opening. Now it was up to her. Tasks that Lindsay loved doing—shopping and decorating for Christmas. Lindsay had reached Manu Halapeli, the groundskeeper, and he agreed to help put up the lights once she purchased them. He gave her advice on how many strings of lights to buy for the exterior, and she estimated for the interior. Ninety minutes later she arrived back at the inn with her aunt's minivan stuffed with lights, wreaths, several red and green foil-wrapped poinsettia plants with big red bows, ornaments, and a spool of shiny gold ribbon. Manu, a lean Hawaiian man of about fifty years old, greeted her. "Hi Manu. We're cutting it close. Why don't we put up the interior lights today and the exterior tomorrow?" "Sounds like a good plan," he said with a smile. "I'll unload the van and grab my ladder." Lindsay had already grabbed a large box filled with packages of lights. "I'll help unload," she said, heading toward the entrance before he could take her box. They worked diligently. An hour later Lindsay stepped back and admired their handiwork. "You are a pleasure to work with, Manu. We got so much done." She rubbed her neck. "You are a work horse, just as your uncle mentioned." "What else did my uncle say?" Lindsay held up a wreath over the electric fireplace mantle in the sitting room. "Not to try to stop you or slow you down because that was impossible." Lindsay paused. "What? That's not true. I stop sometimes." Manu laughed. "I've yet to see you stop. Didn't you have a five-hour flight this morning from California? Have you eaten anything?" Suddenly her stomach growled, preventing her from denying her hunger. "I'll eat after the guests arrive and get settled." "Would you like me to hang the wreath?" "Yes, please. I think these rooms look wonderfully festive." They had managed to hang lights in the three main guest areas. She still needed to purchase a tree. "And can you hang a wreath on the front door, too?" With the wreaths the lobby was beginning to smell like Christmas. She found the spool of the gold lame ribbon she'd purchased. She planned to unravel it on the mantel. "With the candles lit, this ribbon will really shine." "I need to do more with the tiki bar," she said. "The existing lights are inviting, but it needs a holiday touch." "Hmm... maybe a garland of surfing Santas?" "You haven't seen a surfing Santa? This time of year, you will see Santas everywhere, even surfing." "I can't wait to see that. I was thinking of poinsettias." Lindsay skirted around the rooms, dropping off poinsettias here and there. "I want one in each guest room, too." "Guests will like that," Manu said, closing up the ladder. "Do you need anything else, ma'am?" "Oh, please call me Lindsay. I could not have done this without you." "I will come by in the morning to finish the outside lights. You have my cell if you need anything." "I truly appreciate all your help. Mahalo." "You're welcome." Manu closed the door behind him. Lindsay locked the door, grabbed two poinsettias, and zipped up the stairs to take a soothing hot shower. If the Applegates' flight was on time, she didn't have much time. She deposited one plant on the dresser in each of the guest rooms. Minutes later she stood naked under the pulsating spray of the shower. She would have preferred to stay in longer but turned off the water after rinsing the soap off her body and washing her hair. Wrapped in a towel, she finally opened her suitcase. Some of her clothes were wrinkled; some would be fine after being hung up. She selected a floral skirt and white blouse, then slipped on sandals. Using the towel to dry her hair, Lindsay thought about dinner. If the women wanted to eat out, she would provide suggestions. If they wanted to eat in, Lindsay would cook something for them. As she thought about menu options she blow-dried her hair. She took a few minutes to unpack, then headed downstairs to unlock the door and check the flight status of the Applegate women. Victoria M. Johnson knew by the time she was ten that she wanted to be a writer. She loves telling stories and she's happiest when creating new characters and new plots. Avalon Books and Montlake Romance published Victoria's fiction debut, The Doctor’s Dilemma, (A 2012 Bookseller’s Best double finalist). Her other fiction book is a collection of romance short stories titled, The Substitute Bride. She is also the writer and director of four short films. Visit Victoria's website at victoriamjohnson.com for inspiration and tips and connect with her on Pinterest, Twitter and Facebook.